Cars and bikes in the movies have the power to inspire people. Who doesn’t want to travel somewhere in the car of their dreams inspired by the character of their favourite movie? There are many desirable vehicles and bikes featured on the big screen. 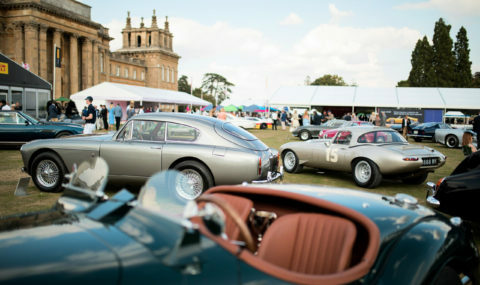 On Oscars week, Salon Privé celebrates cars & bikes in the movies with these five famous machines which have graced the lawns of Blenheim Palace in previous years. 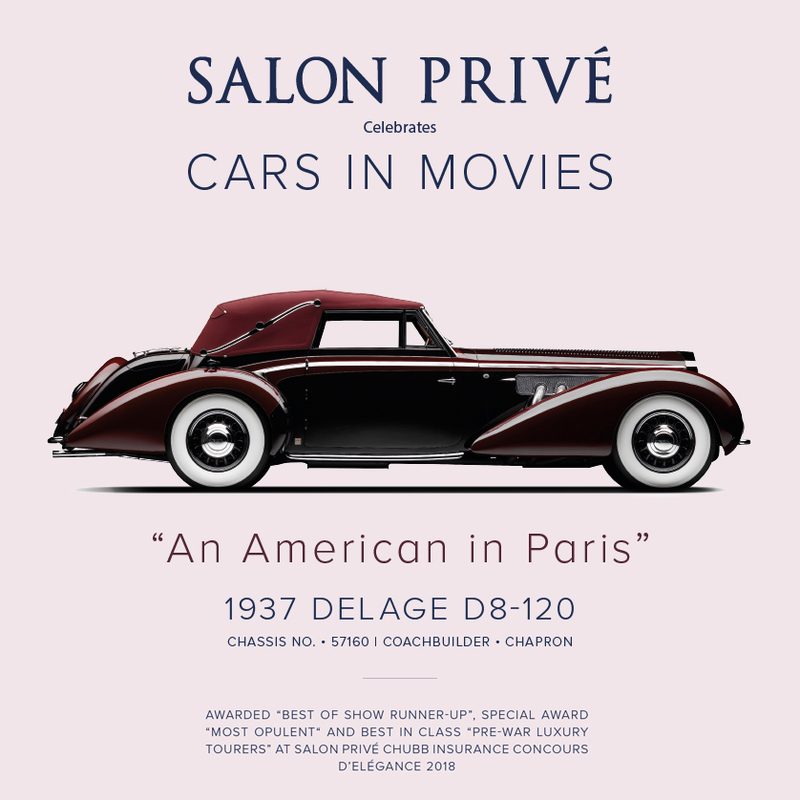 The Delage D8-120 featured in the 1951 classic movie, “An American in Paris” showing Gene Kelly being chauffeured around Paris with actress Nina Foch. 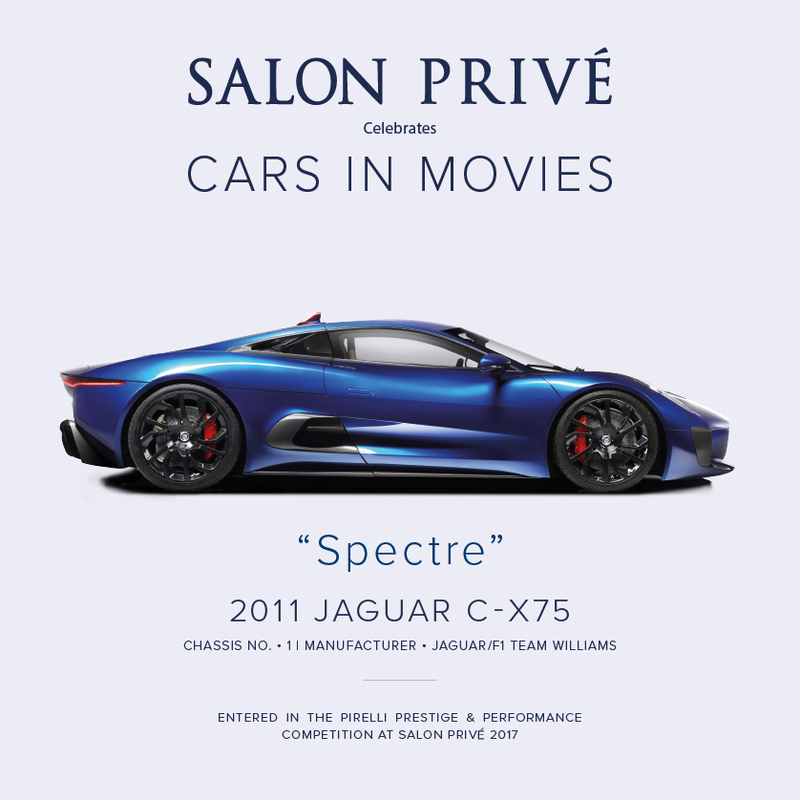 The film’s producers commissioned well-known coachbuilder, Henri Chapron to make some alterations to the car’s design, including tail light modifications and new green coachwork. 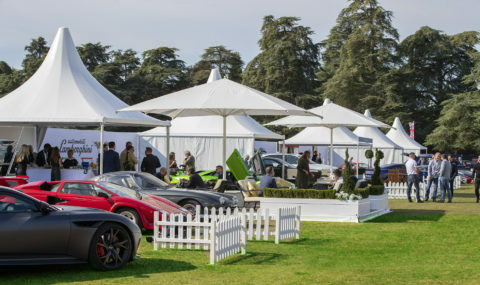 At Salon Privé in 2018, this beautiful car received 3 awards including Best of Show Runner-Up, Most Opulent Winner and also Best in Class in the Pre-War Luxury Tourers. 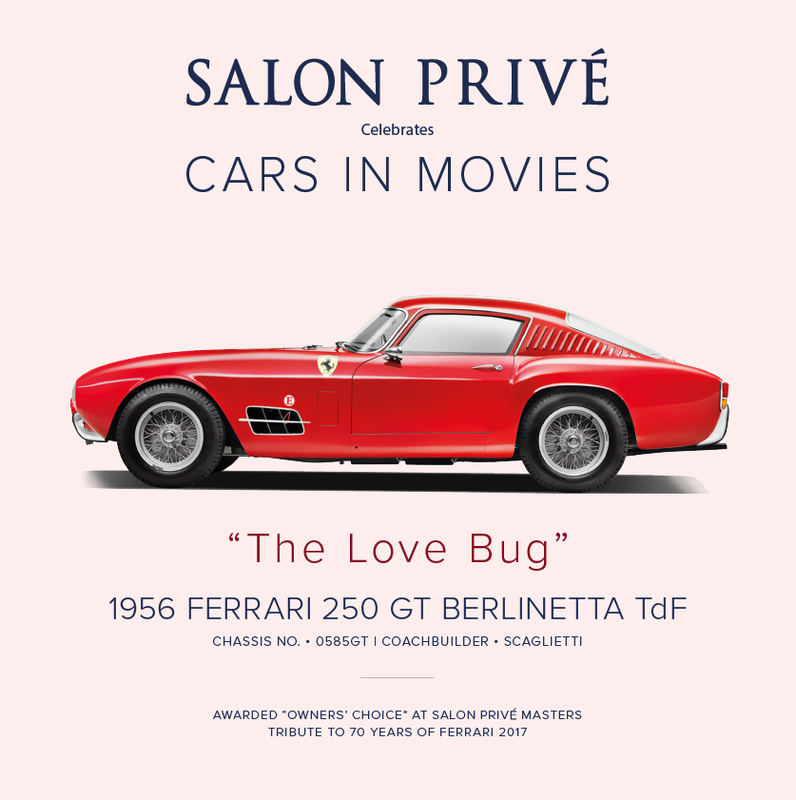 Famously owned by Walt Disney, this Ferrari 250 Berlinetta TdF co-starred alongside the Volkswagen Beetle “Herbie” in the Disney favorite “The Love Bug”. Designed by famed car builder Pininfarina and built by Scaglietti, this particular example, chassis #0585GT, was the first of the “14 Louvre” cars for the 1957 model year. This sensational sports car won ‘Owners’ Choice’ at Salon Privé in 2017. Steve McQueen’s “The Great Escape” wouldn’t have been nearly as memorable without one of the most famous motorcycle jumps in cinematic history in which McQueen attempted to jump his Triumph TR6R over the barbed wire border crossing between Germany and Switzerland. The “Escape“ motorbike was built to special order by well-known Triumph competitor, Ken Heanes. When building the bike, there were 3 specific pre-requisites; it had to be appear both militarised, as well as ‘Germanic’ and not resemble a contemporary motorcycle at all. 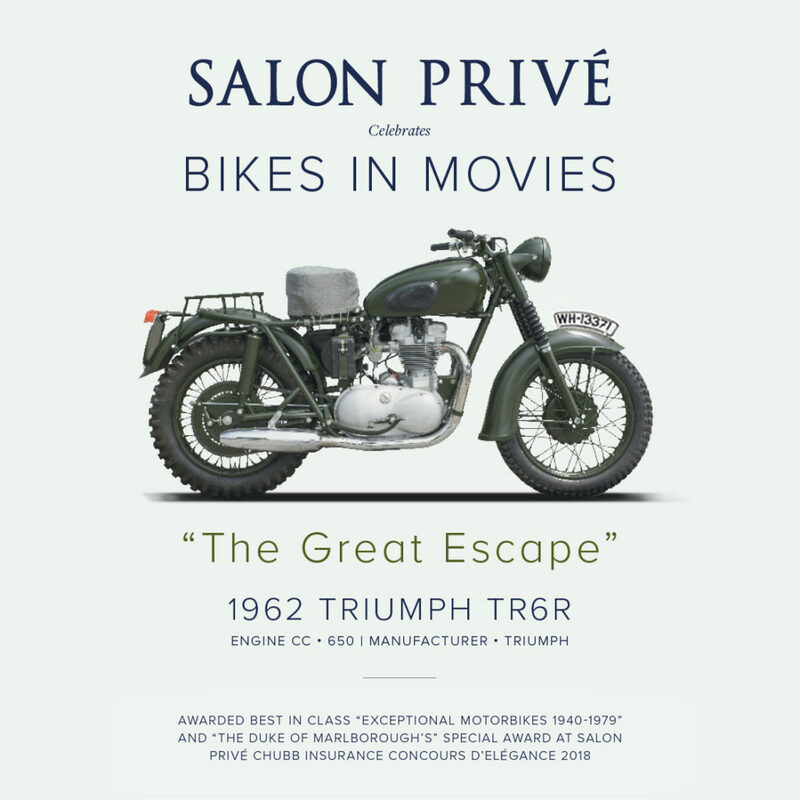 The bike made its first public appearance since 1963 last year at Salon Privé receiving The Duke of Marlborough’s Special Award as well as winning Best in Class in Exceptional Motorbikes 1940-1979. 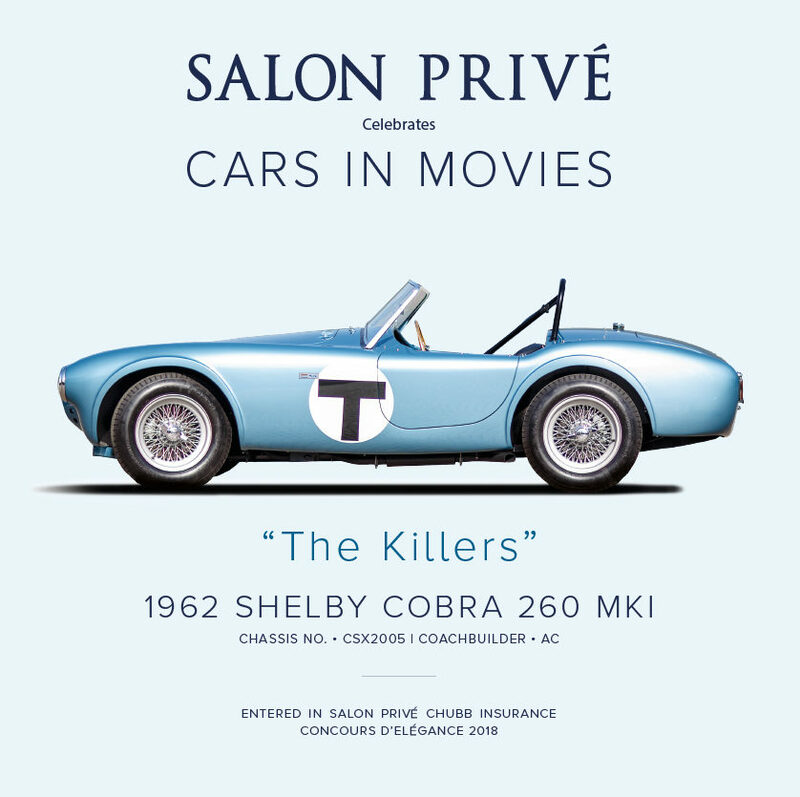 An automotive legend – this particular Shelby Cobra 260 MKI was the 5th car to be produced and featured in the 1964 movie, “The Killers” starring Lee Marvin, Angie Dickinson and Ronald Reagan in his final film role. The car has a fantastic history. The car’s first owner traded it back to Shelby American in August 1963 for a different Cobra, and the 260cu in, Ford V8-engined roadster was subsequently repainted prior to its appearance in the thriller. This celluloid gem saw the Cobra feature prominently in a memorable on-track scene involving Cassavetes and femme fatale, Angie Dickinson. It also appeared in ‘race’ footage which underscored the plot. Remarkably – and unusually, this fabulous machine still employs its original engine. In July 2018, “The Killers” was selected to be screened in the Venice Classics section at the 75th Venice International Film Festival and in September 2018, the car was entered in the “Wind in Your Hair Class” at Salon Privé. Shot on location at Blenheim Palace, who can forget the epic car chase in “Spectre” between 007 in his Aston Martin DB10 and the villains in their Jaguar C-X75. In all, 7 cars were supplied to the film studio. This hybrid-electric, 2-seat concept car produced by Jaguar Cars in partnership with F1 team Williams engages in a high-speed chase with Bond’s Aston through the streets of Roma. In 2017 one of them entered the Pirelli Prestige & Performance Competition on the supercar event, Blenheim Palace Classic & Supercar. This spectacular car competed alongside Aston Martin, Bentley, McLaren, Rolls-Royce and TVR in the ‘Best of British Class’.